Open Cities Africa is an initiative carried out in 10 cities in Sub-Saharan Africa, to engage local government, civil society, and the private sector to develop the information infrastructures necessary to meet 21st-century urban resilience challenges. The project is aligned with the Global Facility for Disaster Reduction and Recovery’s (GFDRR) Resilient Cities Program and is implemented through a unique partnership between GFDRR and the World Bank, city governments, and a partner community comprised of regional scientific and technology organizations, development partners, and technology companies to support upcoming or ongoing World Bank-supported activities in the selected cities. For the purposes of disaster risk management, the Revolutionary Government of Zanzibar (RGoZ), specifically the Commission for Lands (COLA) and the Department of Urban Planning, have noted the need to update their Zanzibar Master Plan with locations of all the built structures and flood-prone areas in the city. Spatial Collective, the implementing partner of Open Cities Africa, spent many months on Zanzibar working with the local stakeholders and coordinating various data collection activities. The goal was to generate and visualize datasets critical to disaster risk management and to build the capacity of government staff, university students, and communities in the process. Finalize the digitization of buildings on Unguja Island, the largest island of the Zanzibar Archipelago. Ensure that the dataset was of acceptable quality by the stakeholders. Assign building reference numbers to the entire dataset following very specific nomenclature put forth by the Zanzibar’s Commission for Lands. 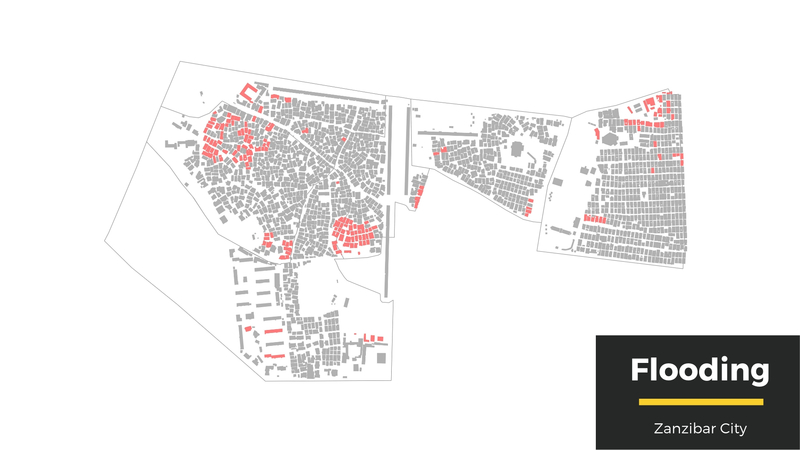 Carry out community mapping of amenities and a household survey in six of Zanzibar City’s shehias or wards. Provide a series of visualizations and in the process transfer knowledge to State University of Zanzibar (SUZA) and Zanzibar Commission for Lands (COLA) students and staff. Building upon the previous efforts, the main objective of the Open Cities Project on Zanzibar was to finalize the digitization of all the buildings on Unguja Island. For this reason, a digitization workspace with several computers and a localized network for accessing and sharing data was established at the Commission for Lands. A dozen former students from the Zanzibar State University used the workspace to digitize about 160,000 buildings, mostly in Zanzibar City. These buildings were added to the pre-existing dataset of 200,000 buildings, completing the digitization of Zanzibar Archipelago’s largest island. The entire dataset was re-checked for errors and building reference numbers were assigned following the nomenclature put forth by the Commission for Lands. After the digitization was complete, it was time for fieldwork. The aim was to collect data critical to the Commission for Lands’ urban planning efforts, specifically on flooding, waste management, and transportation. The stakeholders agreed to carry out a household survey and GPS data collection in six shehias or wards. 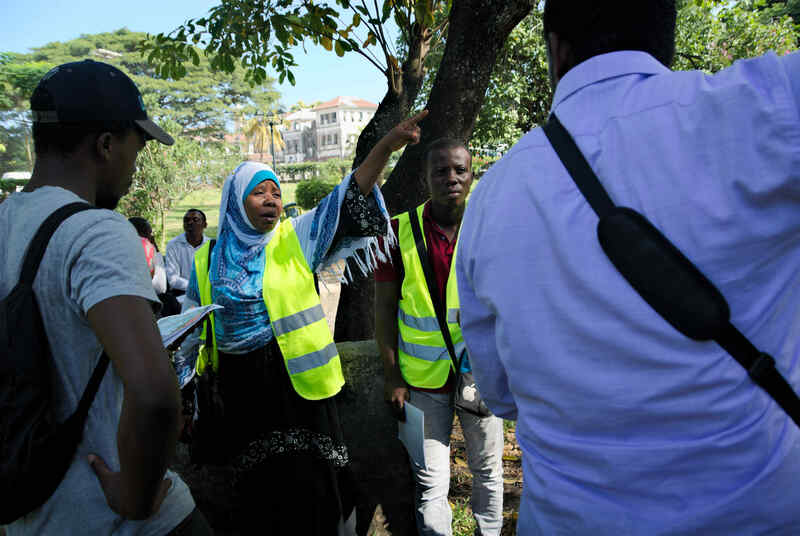 Twenty former State University of Zanzibar students, several Commission for Lands staff, and community representatives from each shehia were trained and participated in mobile and GPS data collection. 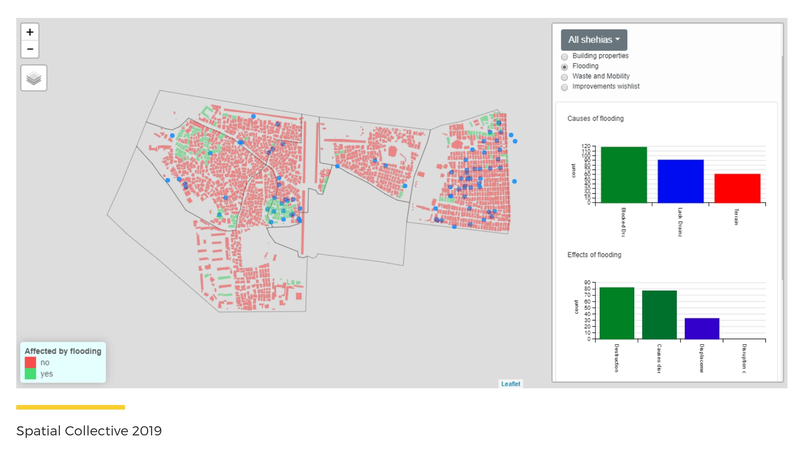 Altogether, 2,100 buildings were surveyed using Open Data Kit and ONA software. The data touched on registering building types, collecting basic demographic information, documenting people’s experiences of flooding, determining access to waste management services, and assessing transport patterns and habits of residents. GPS data collection of relevant amenities was also carried out in the area. At the end of each day, the data was sent to the Zanzibar’s Commission for Lands where it was stored and visualized. Likely the most important effort in this project was directed to working with existing data communities on Zanzibar and building capacity of University students and the Commission for Lands staff. A dozen full-time digitizers were engaged between July 2018 and end of October 2018 and approximately 30 people were trained and participated in GPS and mobile data collection in January and February 2019. 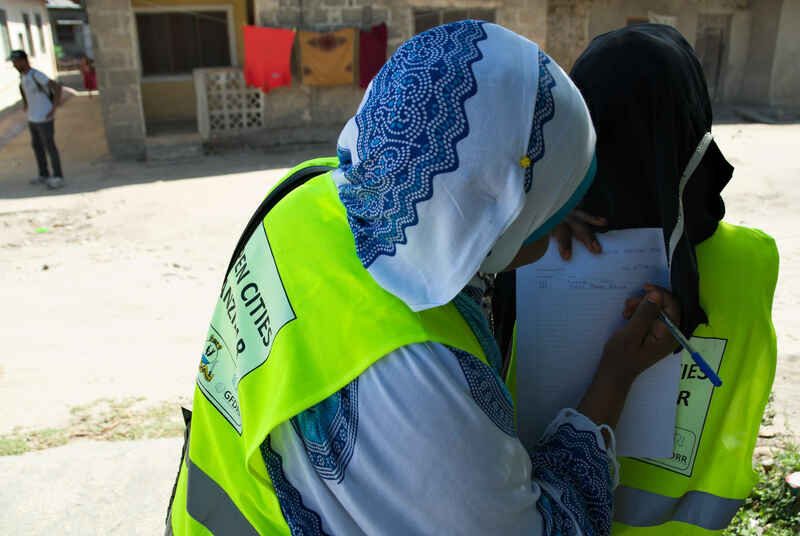 The trainees and data collectors were former SUZA students and COLA staff, community members, shehia administrators, and local emergency responders. At least 25 training events were at the Commission for Lands touching on QGIS essentials, quality control and quality assurance, and OpenStreetMap. 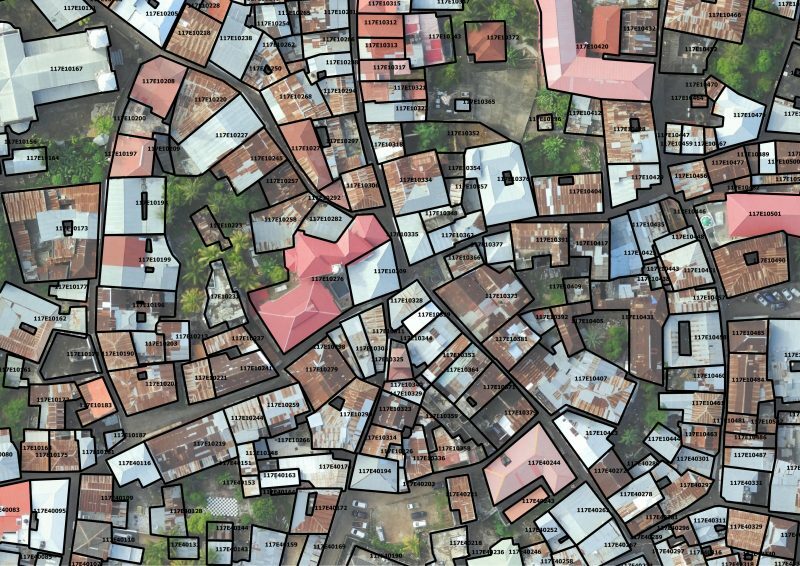 To raise awareness about the project, half a dozen public events were held in and around Zanzibar City, and a large delegation from the Island attended both FOSS4G conference in Dar es Salaam and MapBox training on Zanzibar. In February 2019, the Open Cities Zanzibar team had the privilege to present its work to the Director of Social, Urban, Rural and Resilience Practice at the World Bank. 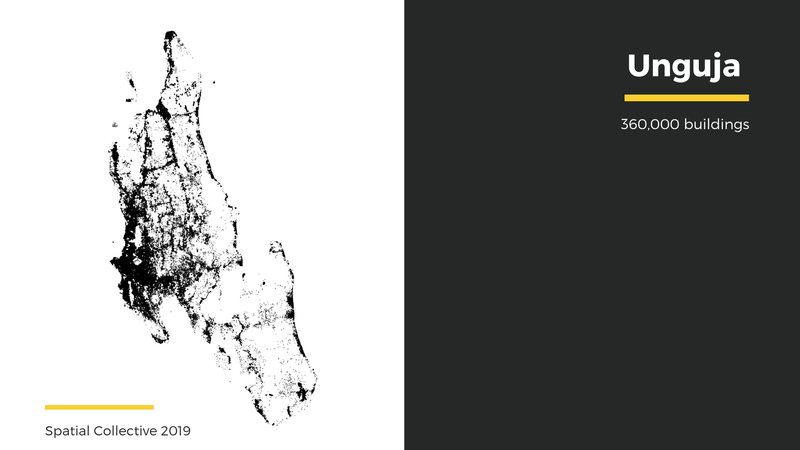 Between July 2018 and February 2019, 160,000 buildings were digitized and added to the pre-existing dataset of 200,000 buildings on Unguja Island, completing the digitization of Zanzibar Archipelago’s largest island. The buildings were checked and corrected for errors and building reference numbers were assigned to each building. Several roads on Unguja Island and about 20,000 buildings on Pemba Island were also digitized. In February, a household survey of about 2,100 households and GPS mapping within 6 shehias was complete. An interactive map of the area and several printed maps were made openly available. All the drone imagery is also made available to the public under a creative commons license. Finally, a series of blog posts, social media posts, and manuals documenting and promoting Open Cities activities Zanzibar were written and shared with the public. Zanzibar has been through some sort of a renaissance of geospatial activities and open data in recent years. The whole archipelago was mapped using drones and hundreds of thousands of buildings were digitized just in the last two years. More importantly, dozens of youth worked on these projects, gaining crucial skills in mapping and other geospatial activities. To keep the positive momentum going, it is crucial to develop a working environment for these emerging data and technology communities on Zanzibar. The Islands needs something like an urban laboratory, where creative ideas could come to fruition. A place like that could support the government in its endeavors and perhaps, more importantly, find innovative ways to share the data back with the people.